This week we'll examine Total Risk in the US over the past 12 months (using the Russell 3000 as a bellwether) to better understand the mechanics of the market's swift recovery from the slump of late 2018. While we typically focus on the drivers of factor and market performance, it's also vital to determine how risk is trending (in particular the correlation between stock and factor risks) so we can contextualize the nature of this rally. 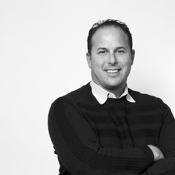 Even if the market is seeing continued strength, we need to be aware if there are heightened levels of risk. US stocks drifted upwards during the week and then climbed to near-record highs on Friday (not captured in above chart), after encouraging Q1 prints from the early slate of companies (most notably JPM) sparked investor optimism in a better-than-expected earnings season. Profitability and Earnings Yield again saw the largest gains on a normalized basis, with both of them rapidly climbing back into Neutral territory. This suggests that investors have been buying quality stocks with good earnings profiles. Positive momentum in Size slowed down a bit, with the factor now sitting firmly in between our Overbought and Extremely Overbought indicators. 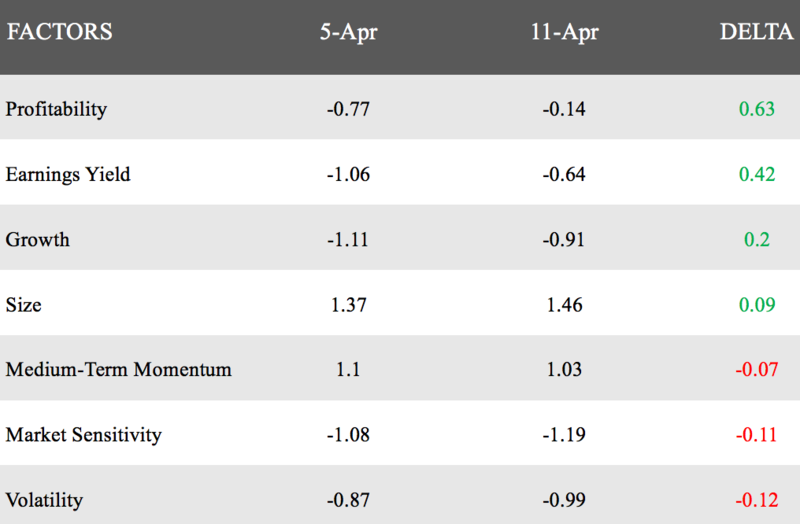 Market Sensitivity and Volatility saw slight moves down on a normalized basis. Growth crossed the Oversold threshold and now appears poised to climb back towards the historical mean. In last week's Factor Spotlight, we used factor mimicking portfolios to dig into the Volatility and Market Sensitivity factors. Through that methodology, we determined that recent positive cumulative gains in the two factors had been driven by a sell-off in names that had negative exposure to them, rather than by a true risk-on flood back into Volatility and Beta-heavy names. As the market has continued to tick up over the past week, we now want to examine how Total Risk has trended in the US, to better contextualize the market's recovery since 4Q18. First, an understanding of how we define Total Risk is in order. Total Risk is a measure of the combination of individual stock risk and factor risk in the market. Every stock has an exposure to a factor, and every factor has a correlation to other factors. As factors and stocks become more correlated, risk will rise. As correlation falls, so does risk. Therefore, it's important to not just measure volatility, but correlationbetween securities and factors. In other words, the market may be rallying, but if stocks are simultaneously becoming more correlated, then we'll see elevated risk levels. If stocks/factors are more diversified and not moving in lock step, while returns are concurrently increasing, this suggests a less risky market. With that in mind, let's take a look at Total Risk for the Russell 3000 index over the past year. Risk for the Russell 3000 is 99.9% correlated to that of the S&P 500, so it's safe to assume we're looking at a true arbiter of risk for stocks in the US. 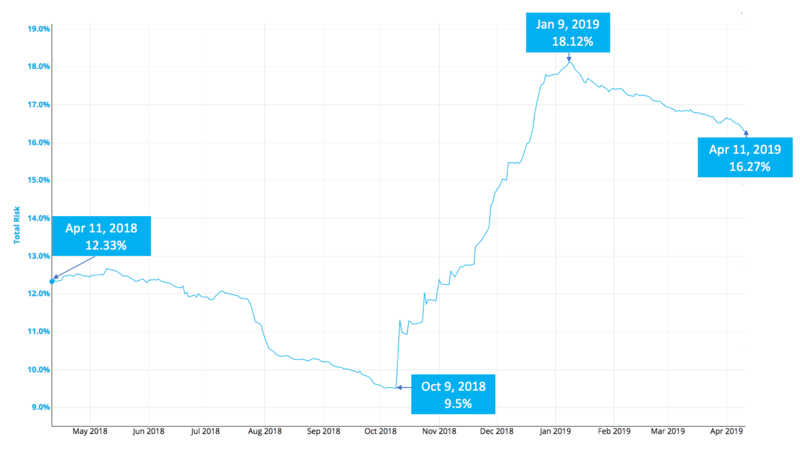 Over the past 12 months, we've seen risk fall from 12.3% to a nadir of 9.5% on 10/9/18, after which the market downturn precipitated an immediate and massive spike. Total Risk levels continued to shoot higher until reaching a peak of 18.12% on 1/9/19. Since then, risk has started to drift back down but remains elevated at 16.27% as of 4/11/19. 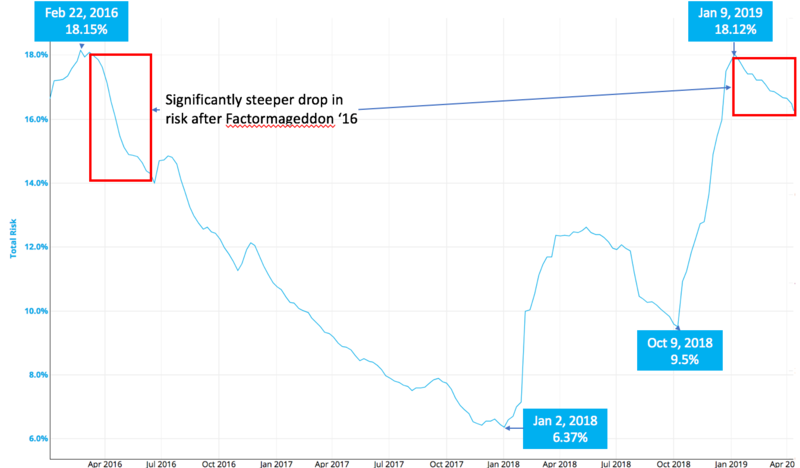 Here we can see that in the risk spike after Factormageddon, Total Risk peaked at 18.15% on 2/22/16, nearly identical to the peak of 18.12% on Jan 9 of this year. When the market started coming back, there was a multi-year period when risk continued to fall, up until early 2018. It then saw an increase until May '18, started to fall again during the Summer, hit the recent Oct 9 trough, and then exploded in October. Very notably, the slope of the chart also shows us that Total Risk levels fell at a more rapid pace during the 2016 recovery compared to what we've seen over the past few months of 2019. The headline risk number as proxied by the Russell 3000 suggests that the US market is still in an elevated risk environment. While the trendline is moving down, we're seeing the pace that the market is shedding risk is slower than what we had seen in the wake of Factormageddon 2016. Because higher risk inherently implies higher correlation of stocks and factors, we have evidence that investors are still eyeing the macro landscape vs. individual stocks, and the market may be on shakier ground than the rally has suggested. Therefore our thinking remains fairly conservative. Next week we'll run the same analysis in the worldwide model to see what we can determine is happening on a broader global basis. If you'd like to learn more about Total Risk or your portfolio's relationship to factors, please don't hesitate to reach out.